Bend the knee -- the mother of burgers has arrived. 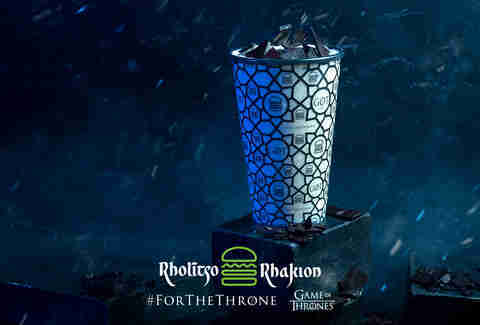 Rholītso Rhakion (that’s Valyrian for Shake Shack, by the way, but surely you already knew that) has joined alliances with Game of Thrones in honor of the beloved series’ concluding season. 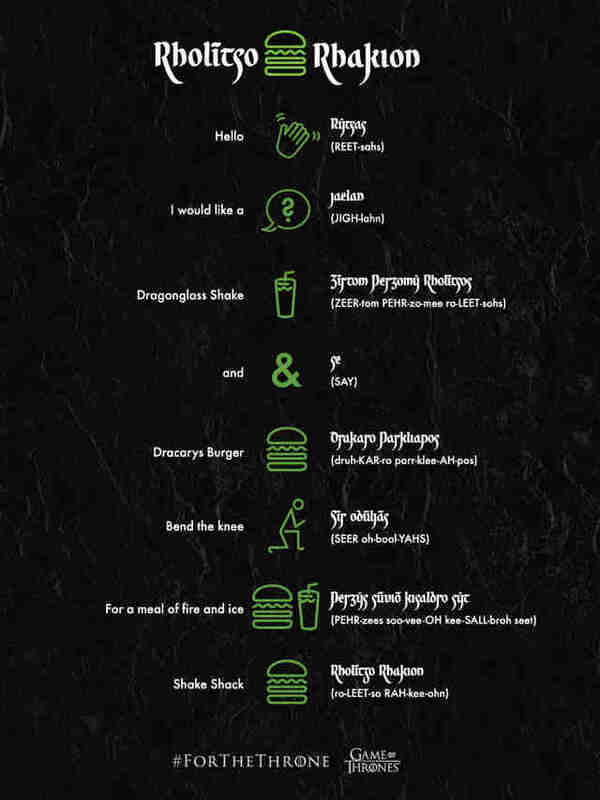 To celebrate -- or mourn -- the ending, Shake Shack has introduced two fire-and-ice-themed menu items, available now nationwide: the Dracarys Burger and the Dragonglass Shake. But here’s the catch: to conquer the burger and shake, one must order them in Valyrian. Don’t worry though -- I brushed up on my Valyrian to secure an early taste of the exclusive items. First, there’s the Drakaro Parkliapos -- or the Dracarys Burger -- which lives up to its fiery name. The double decker burger is composed of locally sourced beef layered with two slices of melty Monterey Jack cheese. On top of the throne of meat and cheese are crispy strips of bacon and the crowning glory of this burger: a spicy ShackSauce that contains herbs, green onions, and a generous amount of heat thanks to chipotle peppers and Carolina reapers. The whole thing is held together via the Shack’s classic, buttery potato roll. I was pleasantly surprised by how spicy the burger actually is -- perfectly balanced with the saltiness from the patties and cheese. The meat is tender, yet has crisp edges from the smashing technique Shake Shack may or may not have learned from The Mountain. The Monterey Jack is gooey and mild, harmonious with the chile from the creamy-but-spicy ShackSauce. It’s juicy and hearty; like Varys' gossip crossed with Robert Baratheon's appetite. I think the inclusion of chopped chiles or pickles -- something acidic to cut through the heaviness of two patties, cheese, and a cream sauce -- would be a welcomed addition to really take this burger to the next level. Yes, I am suggesting adding more chile to a dish that contains Carolina reapers because I am not afraid of fire. In spite of that, I need to be clear: The burger has the kind of heat that'll make you feel like Viserys getting his face melted with molten gold. Or Mance Rayder burning at the stake. Or an army of Lannisters getting straight-up roasted by Drogon. 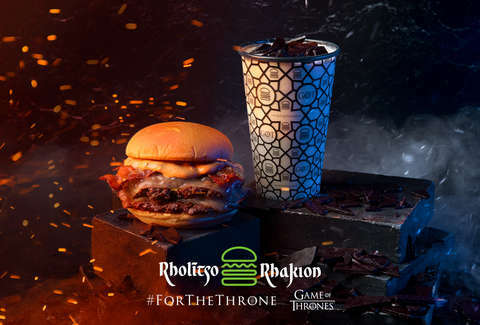 To balance out the flames from the Dracarys Burger, the Zīrtom Perzomy Rholītsos (or Dragonglass Shake) is the perfect foil, the Jon Snow to the burger's Dany. The custard is allegedly frozen with harvested snow from beyond the Wall (I’m curious as to how they transported it to New York City), flavored with mint and white chocolate. The flavors of mint are subtle enough to avoid overpowering the white chocolate like an unleashed army of White Walkers (which would be a bummer), letting the sweetness shine through. To grant this shake -- and subsequently its consumer -- even more power, the frozen treat is topped with shards of Dragonglass (which seems unsafe for consumption, but through careful munching, I found that the taste of Dragonglass is reminiscent of light toffee). If you don’t eat all your Dragonglass immediately, the Zīrtom Perzomy Rholītsos will absorb it, transforming your cloud-white shake into a sweeter, obsidian-colored beverage. Truthfully, I enjoyed having the toffee flavors seep into the mint. Though the burger and shake combination left a strong impression -- one strong enough to take the throne -- the collaboration is only available for a limited time. So hurry forth and bring your tastebuds and stomach honor. If you’d like to practice your Valyrian when ordering these, refer to this handy guide below. Kat Thompson is a staff food writer at Thrillist who -- like Dany -- loves gruesomely fiery things (namely food). Follow her on Twitter @katthompsonn.